Michigan set the recruiting world on fire last week and some change when the Wolverines added six commitments to the 2019 class and two to the 2020 recruiting class. And more good news looks to be on its way as at least three 2019 top targets are expected to make their decisions in the next couple of days. COMMITMENT video will be released this weekend!!! #AG2G #GigEm ?#Go Rebels ❤ ?#WeAre 女 ?#GoBlue 〽 ?#RollTide ? 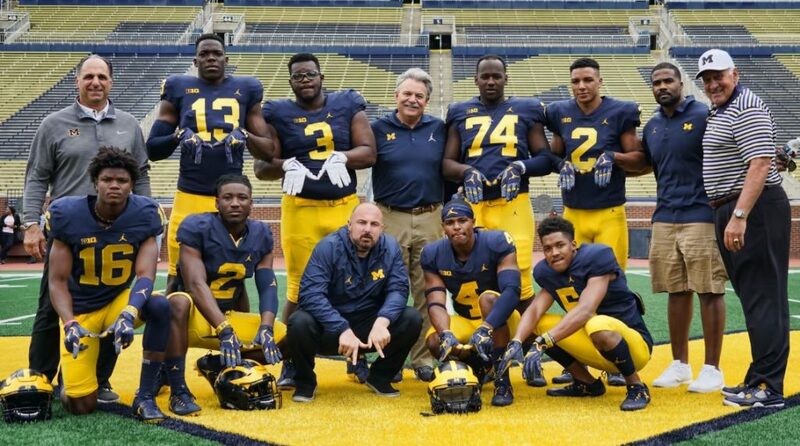 Lausanne Collegiate (TN) RB Eric Gray is a wanted recruit but the visit to Ann Arbor for the mega recruiting weekend, his it in the offense, and connection with RB coach Jay Harbaugh looks like it’ll be more than enough for him to choose the Wolverines in that video. The 247Sports Crystal Ball predictions have been flowing in for Michigan ahead of his decision. If he indeed chooses Michigan, as expected, he’ll give this class one hell of a 1-2 punch at the running back position alongside RB Zach Charbonnet. St. John’s College (DC) S Quinten Johnson is another top target that the staff looked to completely win over during his official visit last weekend. He’s a versatile defensive back with offensive skill position potential and the staff looks to be all in on him joining this class. All 14 Crystal Ball predictions are in for the Wolverines ahead of his decision, which will come during his time in Dallas. It would be a shocker if he didn’t pick Michigan here. Blair Academy (NJ) DE David Ojabo may be newer to the game of football and America but he’s a top target for several top end programs, including Michigan, Penn State, and Texas A&M. But he’s another guy who Michigan looks like they’ll win out on. 90% of the 21 Crystal Ball predictions are in for the Wolverines thanks to his camp visit to Ann Arbor earlier in the month where he won DL MVP honors. The potential is clearly there as the staff has pushed for him and now look likely to receive his pledge on Monday. Other top targets that Michigan is in great shape and could decide not in the not so distant future is Bergen Catholic (NJ) OLB/DE Aeneas DiCosmo and Virginia Tech commit CB Mike Sainristil. Both visited Ann Arbor last weekend and, from all reports and Crystal Ball action, they’re both leaning hard towards the maize and blue. There isn’t a set day for either but, at this point, I expect both to end up choosing the Wolverines.